Australian author Fiona Lowe returns with a juicy family saga, set against the backdrop of Victoria's high country, about unforgettable characters tangled together by a wealthy inheritance, secrets and betrayal. Does it show love? Margaret, the matriarch of the wealthy Jamieson family, has always been as tight–fisted with the family money as she is with her affection. Her eldest daughter, Sarah, is successful in her own right as a wife, mother and part owner of a gourmet food empire. But it's not enough to impress her mother. Always in the shadow cast by the golden glow of her younger brother, Sarah feels compelled to meet Margaret's every demand to earn her love. Does it give security? After a poverty–stricken childhood, Anita has claimed the social status she's worked so hard to achieve by marrying Cameron Jamieson. Although they have a comfortable life, she's never able to fully relax, fearing everything could change in a heartbeat. Or does it mean freedom? Ellie, the youngest, has lived a nomadic and – according to her siblings – a selfish life, leaving them to care for their ageing mother. For her, freedom means staying far away from the strings attached to her inheritance, but she needs to consider her young son's future as well. As their mother's health deteriorates, will long–held secrets and childhood rivalries smash this family into pieces? An addictive story of the relationships between siblings, and of deceit, betrayal and revenge. This book involved a lot of scene-setting, so much so that by the first quarter mark I was ready to abandon it if it didn't pick up pace. It was worth persevering. Don't give up. This was an epic battle between the forces of good and eveil. At one point I wondered if there was going to be anyone left in the good camp. Eventually the ending became fairly predictable. The journey was interesting with very engaging characters. The writer has a great talent for bringing people to life. The backdrop of a Victorian high country town was a character in its own right. It wasn't without its small town politics and petty mindedness, however the way the issues of the book were resolved reflected the changing mores and values of small town Australia. The book opens on Mother’s Day with Sarah awakening to an alarm that didn’t need to be set, way too early for any Sunday let alone Mother’s Day. In what is a common thought for many mothers she finds herself thinking, on more than one occasion throughout the day, that this is supposed to be her day. She hosts a Mother’s Day lunch at her place for her mother and siblings trying to walk the fine line between having a mother’s day for herself and celebrating her mother. I really loved this book and the themes it raised though I have to say that I really didn’t like most of the characters at one point or another. 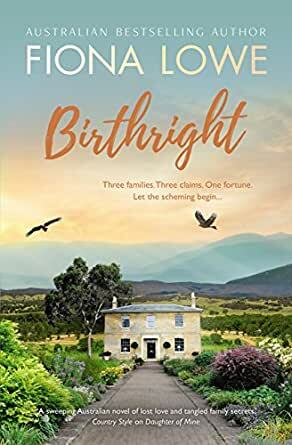 Fiona Lowe started her writing career with romance novels but in the last couple of years has spread her typing fingers and expanded into family sagas, and this one certainly is a saga. There is drama, betrayal, secrets, lies and despicable behaviour. It’s one thing to have a family pull out the swords and fight like carrion over a will after a death in the family when emotions are already high and grief is in the mix. I think it’s a completely different thing for the backstabbing and sneaking around to try and find out, then change, the terms of a will before the family member is even on their deathbed, it is completely reprehensible. Family should be about so much more than what you’re going to get when your loved ones pass away. I know this sort of thing happens, and it happens a lot, but it doesn’t make it any easier for me to fathom. I really enjoyed following the family through fracture and drama to watch them come through the other side. Inheritance isn’t the only issue facing the Jamieson’s, there’s abuse, infidelity, divorce, building new business, out of character teenage behaviour, betrayal, lies and shady business dealings. And that’s before they start uncovering the secrets that were buried in the past. Birthright opens on Mother’s Day and anyone who has had a Mother’s Day that has been a little disappointing will immediately connect with Sarah. Sarah is the oldest of the three Jamieson siblings. She is always trying to please her mother who must always be the centre of attention. Cameron, the middle child, is the mother’s favourite and she makes this fact very clear. Ellie is the youngest, estranged from the family for many years, she has recently moved back to the area. Lowe has written a compelling family drama that includes many themes that faced by families everywhere; the struggle to look after your own children and an aging parent, sibling rivalries that spill over from childhood into adulthood, marriage breakdowns and family secrets. As the story deepens and secrets emerge the characters reveal their true selves and motives. I absolutely devour family sagas, immersing myself in their lives, their battles, their loves and their secrets. Birthright doesn’t disappoint. I swept through the story involving myself in the family, its ups and downs. There is nothing dysfunctional about this family until you peel back the layers of respectability and display the hidden secrets. Birthright is morbidly fascinating and heart-achingly sad. Interweaved between the betrayals, accusations and confessions is a beautiful love story. Fiona Lowe returns again with another brilliant family saga. Margaret is the matriarch of the family. Her three adult children are very different - Sarah, the eldest is partner in a very successful business with her husband Alex, Cameron is married to Anita and is convinced that money is the key to happiness, and Ellie, the youngest who chooses to live a somewhat alternative life with her young son Noah. Margaret has always been a very domineering woman and expects to be treated as a queen. Unfortunately her health is deteriorating and she is becoming forgetful and demonstrating actions that are way out of character. Cameron is the first to pick up on this and wants to make sure that the inheritance he believes should be his is not in jeopardy. Sarah's marriage is breaking down, her children are keeping a secret from their parents and long ago revelations are being discovered. Ellie has been distanced from the family for a number of years because of her past. This is a big book, but did not seem like it as I kept turning those pages. The story is riveting and back stories of all the characters is fascinating. I thoroughly enjoyed Fiona's last book Daughter of Mine, and this one is just as good, if not better. An outstanding depiction of Women's Fiction.